Cecilia Feeley, Ph.D., Devajyoti Deka, Ph.D., Andrea Lubin, and Melanie McGackin. September 2015. 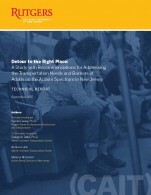 Explore the final report prepared by CAIT’s Cecilia Feeley and VTC’s Deva Deka and Andrea Lubin that explores and documents transportation needs and barriers of NJ adults on the Autism Spectrum in Detour to the Right Place. This report was prepared with funding from the NJ Department of Health and the NJ Governor’s Council for Medical Research and Treatment of Autism.